Visit the Local Host Website for more information about Durban, or sign up for ZADNA/ZACR Golf Day on 19 July at Durban Country Club! Durban is an extraordinary city, the most culturally diverse in Southern Africa. See what's on the agenda for ICANN in Durban. Climate, Currency, Transportation, & more. Book now & take advantage of ICANN group rates. 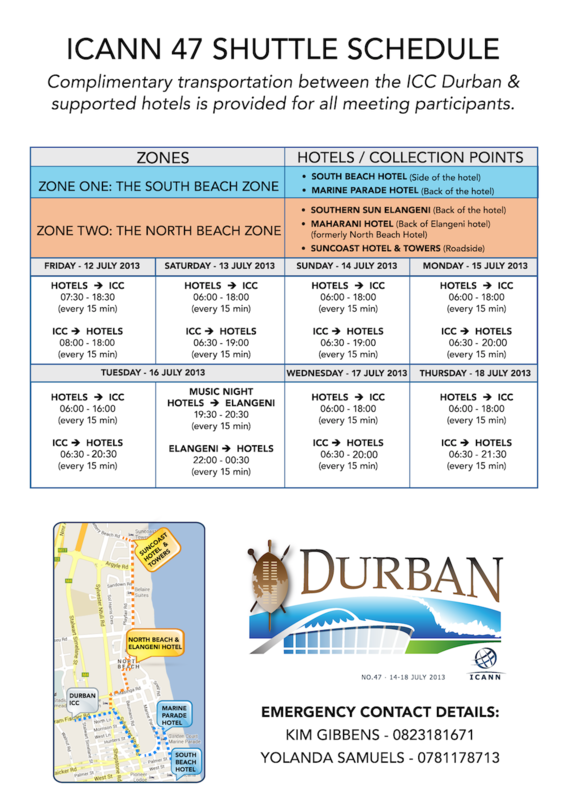 Find your way around the venue, or locate Durban hotels. Free shuttle service for travel between the venue & your hotel. Transportation from Durban’s King Shaka Int'l Airport. Tweets about "icann OR icann47"